Yellowfin Tuna is a very nutritious source of minerals, especially selenium. Selenium plays an extremely important role in cognitive and immune function in our bodies making this fish one of the best sources of this mineral. 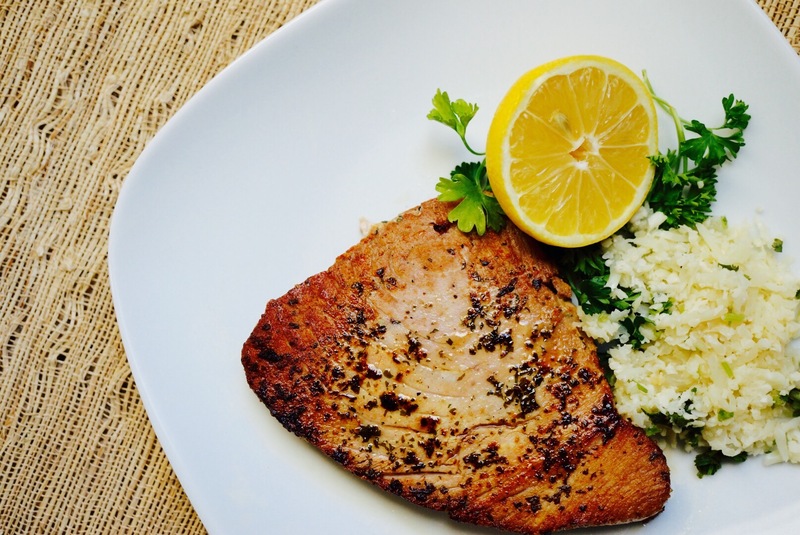 Seared Yellowfin Tuna is easy to prepared. It can be cooked in a matter of a couple minutes! One of our favorite seafood dishes! Be aware of the source of your Yellowfin Tuna. Radiations levels in the pacific are high due to Fukushima, so make sure to look for good sources, such the Atlantic, since the contamination levels of radiation are not as high. If you are concerned about mercury, know that the form of selenium contained in this fish seems to lower its contamination with mercury, making it a good choice of sea food to consume! My recommendation is to pan-sear the outside of the fish in a cast-iron skillet until it slightly crispy, keeping the inside medium rare. Another reason why it is so important to know the source of your fish before you buy it! In a zip lock bag marinate the fish with salt, pepper, garlic salt and cilantro. Place it in the fridge for 20 minutes. Heat ghee in a cast-iron skillet, add garlic cloves. Sear stakes one at a time for a minute on each side. If you would like it medium-well you may cooke it a little longer. Serve with you favorite steamed vegetable or my recipe of Cilantro Cauliflower Rice!